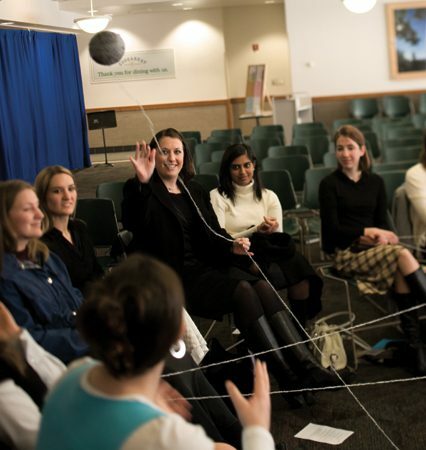 From early-morning council meetings to late-night gatherings for ward prayer, Sunday is no day of rest for BYU’s campus. On one of the biggest sports days of the year, students stream through the Marriott Center doors and cascade down the stairs to their seats. An energetic crowd of more than 10,000 fills the arena with a friendly hum. Two time zones away the Indianapolis Colts and Chicago Bears fight for football’s biggest title in Superbowl XLI, but in BYU’s athletic arena, the student audience listens intently to an Apostle of The Church of Jesus Christ of Latter-day Saints. Standing at a podium on the Marriott Center playing floor, Elder David A. Bednar (BA ’76) speaks to BYU students about seeking living water. 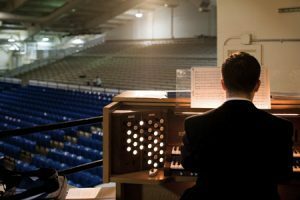 Before the BYU 10th Stake fills the Smith Fieldhouse’s blue seats for stake conference, freshman Jonathon C. Evans (’12) practices the hymn “I Believe in Christ,” which he will play for the meeting. With more than 20 stakes holding semiannual conferences, large arenas like the field house are kept busy on Sundays. It’s fast Sunday at BYU, and the Marriott Center has been transformed from basketball court (on which the BYU men’s team defeated No. 25 UNLV less than 24 hours earlier) into fireside venue. Other buildings across campus have undergone a similar metamorphosis. Science lecture halls, displaying giant periodic tables, have hosted sacrament meetings. Professors’ offices have sheltered ecclesiastical interviews. The Skyroom Restaurant has become a Sunday School classroom. On a day when most colleges enjoy a welcome rest, BYU’s campus becomes one of the busiest and largest centers of worship in the world. 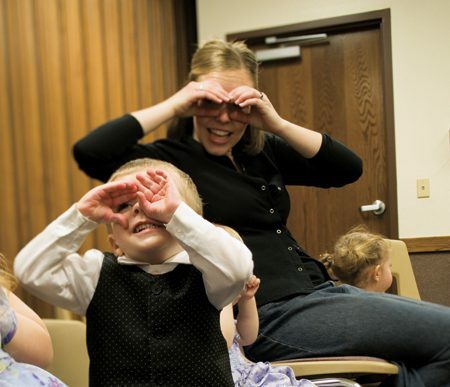 About 160 wards meet at BYU (plus scores more in local meetinghouses), accommodating church services for some 24,000 people. Hymnals, sacrament trays, and pianos come out of closets. Professors, deans, and community leaders become bishops, stake presidents, and high councilors. 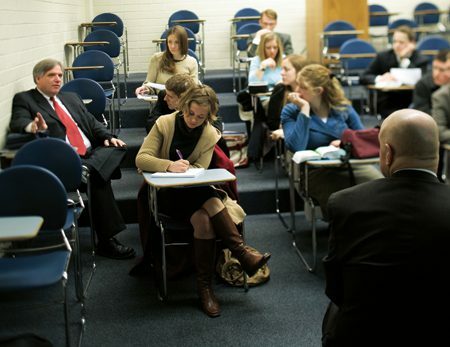 Surrounded by reminders of their academic work, BYU students study the gospel instead of economics, they lead quorums instead of study groups, they share testimonies instead of opposing views. But the endeavor is not all that different, really. As they do five days a week in these buildings, students become educated. They seek learning, and they do it by study and by faith, by instruction and practice. The surroundings are the same, the effort is consistent, the people are familiar. Day in and day out, Sundays as well as Mondays, BYU’s purpose to educate minds as well as spirits remains unchanged. The Cougareat food court hosts members of the 42nd Ward Relief Society, who share ideas on building a web of unity. Drizzling, cold rain isn’t enough to keep about 50 students, mostly freshmen, from gathering for tunnel singing. 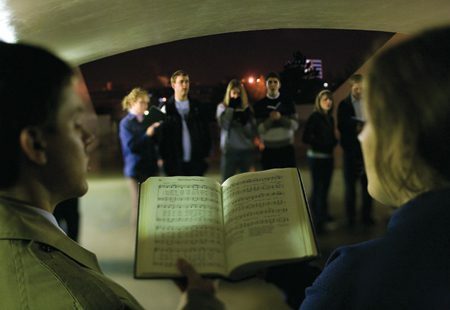 Starting at 10 p.m. each Sunday in a pedestrian tunnel near the Marriott Center, tunnel singing gives students a resonant venue for blending voices and announcing mission calls. The BYU 15th Ward’s “ward prayer” is perhaps a bit of a misnomer. Although the half-hour evening gathering in a Helaman Halls common area concludes with prayer, it also features ample socializing, laughter, and sharing of announcements, talents, and spiritual messages. Paul Scown and nursery teacher Whitney Wheadon DeGroot (’07) “look out the window” for popcorn on apricot trees (far right). 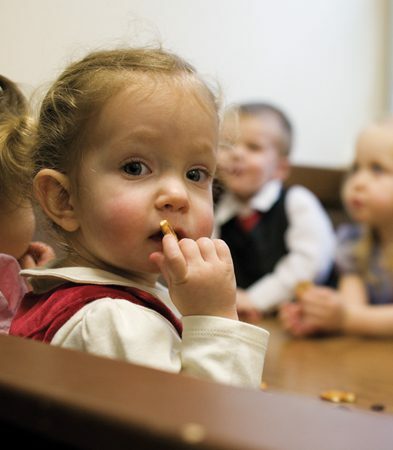 AVa Wheadon snacks on a pretzel between spirited activities and spiritual – but attention-span-appropriate – lessons in her BYU 34th Ward nursery class, held in Wymount’s multipurpose building. 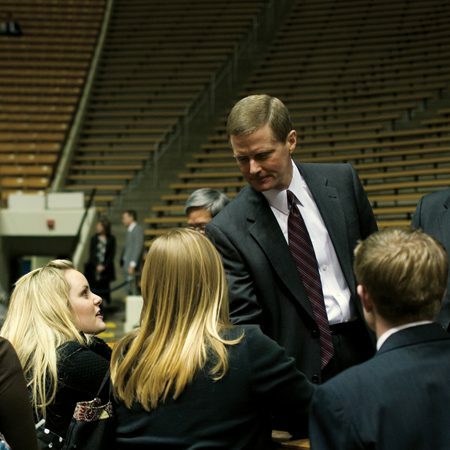 Elder David A. Bednar’s message reached far beyond the Marriott Center’s 10,000-plus to tens of thousands more at Church institutes of religion in several countries. 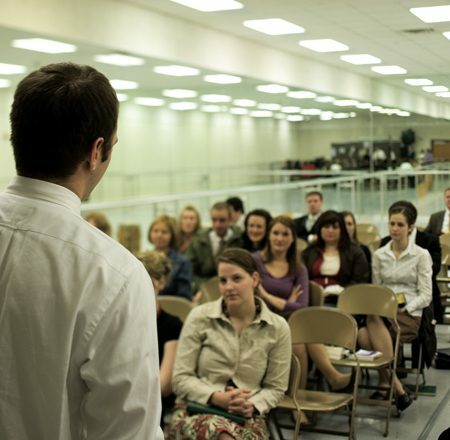 BYU students and their ward leaders turn out in force to hear the words of an Apostle at a Church Educational System fireside address. 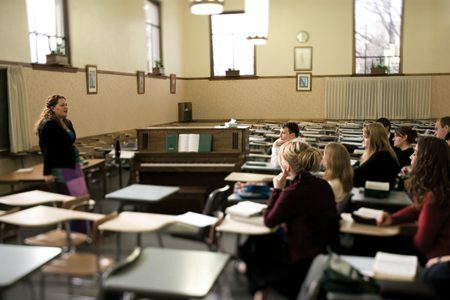 Typically packed with stressed-out test-takers, the testing center (opposite, bottom) provides a tranquil setting for Claire E. Larson’s (’07) Sunday School lesson. 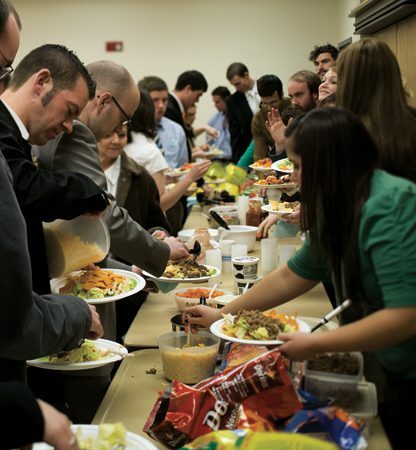 Hungry members of the BYU 210th Ward, particularly ravenous on a fast Sunday, cram into a campus classroom after their ward meetings for a collective meal known as break the fast. Surrounded by mirrors in an RB dance studio, Steven L. Jaussi (’08) of the BYU 115th Ward reflects on his mission during a lesson on baptism. 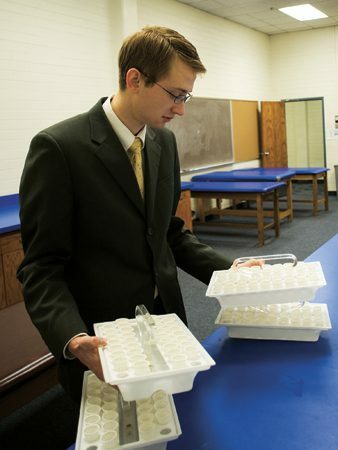 David E. Edwards (’09) prepares to transport sacrament trays from a Smith Fieldhouse athletic truing room to the Cougarette practice room, where the BYU 210th Ward meets. An information-technology expert for the BYU library on weekdays, a high councilor on Sundays, William B. Lund (BS ’78) poses a question during the BYU 210th Ward’s 8 a.m. ward council meeting.